Editor’s Note: This is a post by Daniel Godsil & Johnny Bigfoot. One major flaw I see in the existence of Bigfoot doesn't have anything to do with the evidence or the sightings, it's the numbers. The BFRO states that there are 2000-6000 Bigfoot roaming North America, yet they are seen from Alaska to Florida and everywhere in between. The North American continent is just over 9.3 million square miles; I'll cut that number in half for the sake of argument that they aren't reported in large parts of Canada and other places that aren't viable for them to live. That still leaves you with 4.6 million, or roughly 1 million square miles more than the size of the continental United States and every single state has a documented Bigfoot report so I feel this number is more than generous to continue with what I suggest. The 4.6 million square miles of North America where Bigfoot has been reported for, (I'll use the middle of the estimate) containing 4000 individual Bigfoot is roughly 1150 square miles per individual. There is no possible way for a Bigfoot living in Alaska to meet face to face with one that calls Ohio home and I can't see a logical argument saying that they are part of the same breeding population. Now if you group them into family units this only makes them more isolated from each other; they may live in groups of 25 or more but that means there are greater distances between families. The numbers simply can't live up to the area in which they are seen. This leaves us with an average of 80 individuals per state, add in the Canadian provinces and that number drops even more. There is far too much distance between these individuals to keep their genetics viable. Even grouping by region and allowing them the ability to travel a few hundred miles you still can't get anywhere near the numbers needed to sustain a viable gene pool. The reason I say this is because of what's called the Minimum Viable Population or MVP for short. Now, the estimate of 2-6000 individuals does meet the median MVP number of 4,169 individuals, so the genes are there, they are just spread too thin. If you apply the median MVP of 4,169 individuals and apply it to a reasonable range, you end up with a number in the tens of thousands. This number does make sense to cover the sightings in my mind, but not the fact that so little hard evidence has been found for their existence. 10,000 plus 400+ pound animals are going to leave a noticeable mark on the environment and by all likelihood would have been discovered, documented, and cataloged long ago. 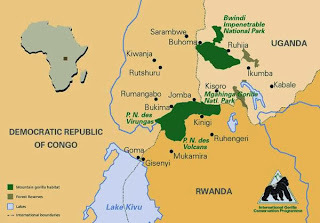 Primates in the wild have very limited home ranges, only about 30 square miles at the most from what I have read and I am by no means an expert on primate home ranges, but I think you can see the problem. If there is an animal out there that you are going to compare Bigfoot with, the best choice as I see it is the Mountain Gorilla. Mountain Gorillas in the wild number just under 900 and live in 2 very small pockets in Africa. Mountain Gorillas in the wild are starting to show signs of inbreeding, and by some this is a MVP but the effect of inbreeding must be considered in their long-term survival. They may make it 100 years at this number but not 1000 years. So you have 2 pockets of Mountain Gorilla with a population of less than 900 in a very small range having problems keeping their genetics in order. How can even 6,000 individuals over 4.6 million square miles possibly maintain a viable gene pool? If you look at the numbers it doesn't add up. The point being that small breeding populations lead to decreased variation in groups and a lesser likelihood of remaining viable. If the breeding population is so low, how can that account for all the varying color variations noted? Black, white, auburn, brown, and grey? How? Regional color variations? Sure, but not across the board. How do/did specific groups of Bigfoot acclimate and develop the skill sets to handle such wide variations in environment? A wholly different skill set is needed to survive in Oregon as Vermont and Texas, only leading you to think that one that lived in those areas couldn't be successful in the other even if they could get there. This does bring up other interesting questions. Is Bigfoot going extinct? Are we seeing signs of inbreeding? Is the decreased number of Bigfoot pushing them to cover greater ranges and opening them up to more sightings? We all know what the standard Bigfoot print looks like, but then there are others with 3 toes. Is this a sign of failing genetics? The same could be said for the increasing number of "hostile" Bigfoot encounters. 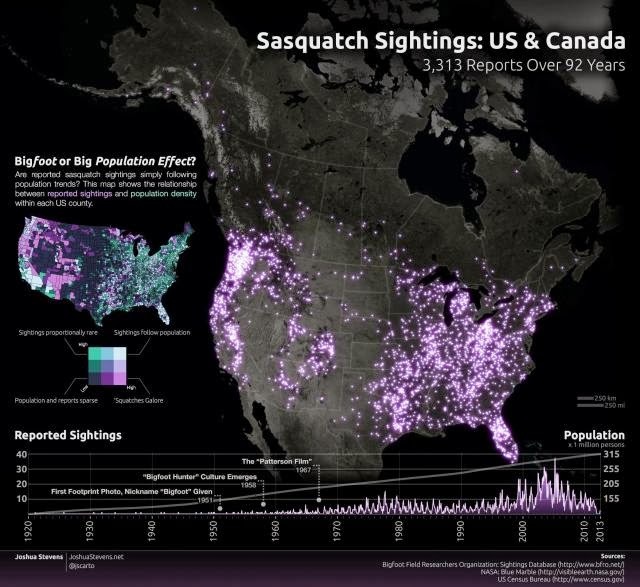 Or is that as Bigfoot's popularity increases, more people are coming out of the woodwork to report sightings. Is the increasing ease of documenting them also a driving factor? Or is that that people are just joining the bandwagon? No one is an expert on Bigfoot, even if they try to pass themselves off as one. Maybe a better term is that we are all students of Bigfoot and we are still learning in albeit incredibly small baby steps. Will they even be around once we grow up and see what's been reported for hundreds of years? If we have so much Diversity of Bigfoot living in completely different Geographic Habitats, do they "speak" the same language? How does anyone know that they speak the same language? The Native tribes had many different languages.